I knew the last couple months before Christmas would be a busy time for me, but I still hate that I have no time to knit anything for myself. I started a pair of socks, but felt so guilty about knitting them I put them away over a week ago. The greenish yarn in the photo is some hand-spun BFL a friend gave me for my birthday. 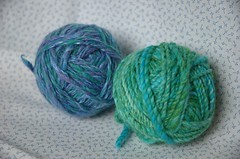 The bluish yarn is some amazingly soft hand-spun I picked up In Nova Scotia on my honeymoon. I plan to use them together in a neck warmer of my own design. I am itching to get started with this stuff, but I am strong enough to put it aside and make the toys on order. Both yarns look yummy. Irresistable. I don't know how you do it - I'd have to cast on straight away! November 5, 2007 at 12:30 p.m.
November 5, 2007 at 1:25 p.m.
Aww - it must be really hard to bring yourself to use your 'pet' yarn! :) Both yarns look gorgeously soft and I have a bunny called Max, so I know how soft a bunny is! Lucky you for finding such lovely wool. November 5, 2007 at 3:17 p.m.